Welcome to Southeast Exposure. 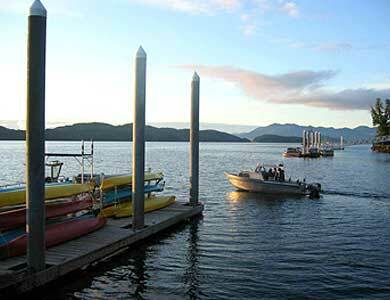 We started in 1986 from our home in downtown Ketchikan. Kayaks soon took over the yard. In 2005 we moved our operation north to beautiful Clover Pass, three miles from the end of the road. The protected waters here are dotted with evergreen islands. 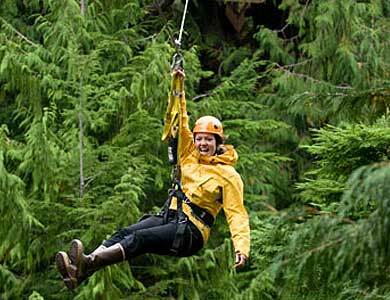 To realize our dream of having a zipline course and move the kayak tours away from the floatplanes, large boats, wind and the noise of the waters of downtown, we purchased an estate and started to renovate and add. We built a zipline course with 8 lines in the big cedars and installed transition elements as well as a zipline that zooms down to an ocean platform. We also installed an optional climbing wall with stairs to climb to the top platform. We support our Tatoosh Islands and Misty Fiords kayak tours with three vessels: Two 24’ Rigid Hulled inflatables (RIBs) and a 24’ landing craft. Our Boatman Tour features three custom built 14’ rigid hulled boats. The kayak fleet would never fit anywhere in our two previous locations. What will you see out here in Clover Pass? Islands ringed by protected waters Seals, sea lions, eagles, intertidal life, jumping salmon, deer and possibly orcas on the hunt and transiting humpback whales. 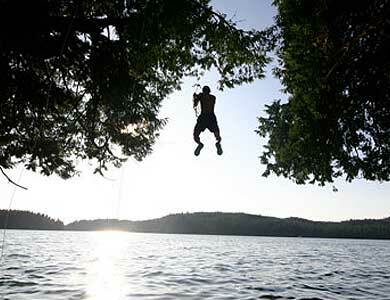 The Southeast Exposure Outdoor Adventure Center (O.A.C.) 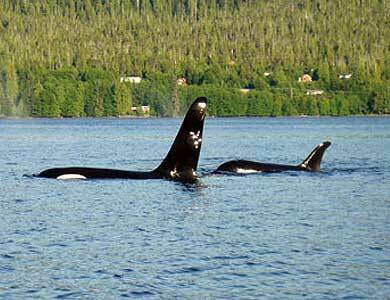 is located north of Ketchikan at mile 14 of the Tongass Highway, on Potter Rd north of Knudson Cove Marina. 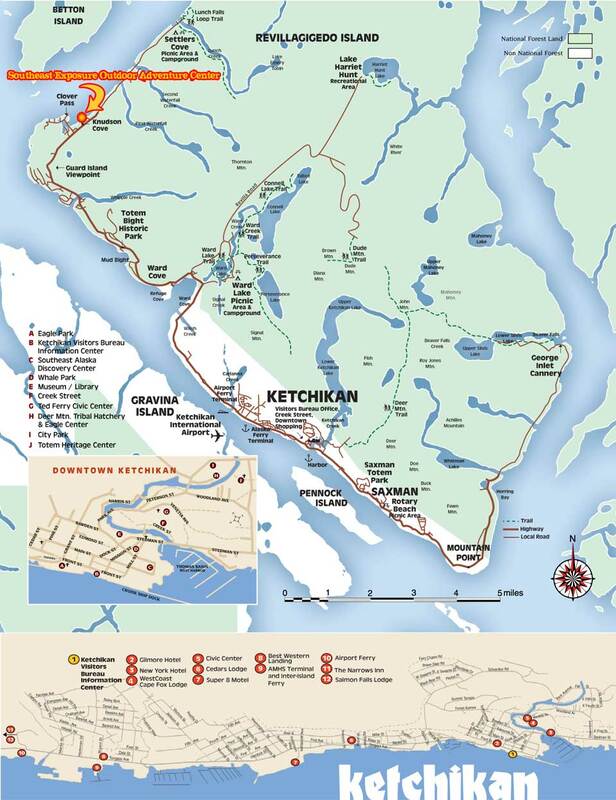 Ketchikan is served from Seattle, Washington, by Alaska Airlines, (800) 426-0333, and the Alaska Marine Highway (800) 252-7522. Summer temperatures range from 50 degrees to 70 degrees F. Prevailing winds are from the southeast. In times of sunny weather winds are from the north. Please make reservations early, especially if you are a couple or solo paddler. This will help us try to match you up with a few others so we can make the four person minimum. We accept payment by certified check, Visa/Mastercard, travelers checks and Alaska checks. A deposit of $100.00 is required to hold your reservation. Because of the rainy and damp weather conditions common to Southeast Alaska, we recommend dressing in layers of polypropylene or capilene, synthetic pile or wool, and rain gear. Flexible footwear is recommended. You should also bring a hat, gloves, camera, and binoculars. Round trip transportation by excursion boat includes guide service, single or double kayak, tent, safety equipment and food. We will send an equipment list of suggested items to bring upon trip confirmation. 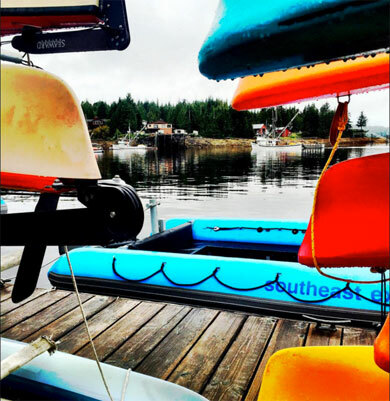 Sea kayaks are available to rent from us at the Outdoor Adventure Center on Potter Rd. You must be an experienced paddler and be fit enough to do your share in carrying your kayak above the high water mark. A $200 damage deposit is required for all overnight rentals. 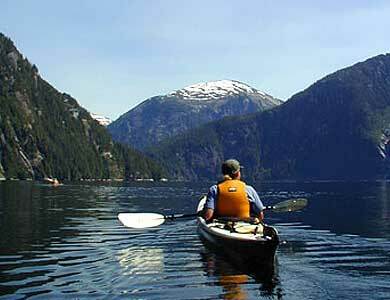 Kayaks are equipped with rudders, spray skirts, Type III PFD's, pump, rescue float and paddle. A 3% sales tax is applied to all rentals and sales. Learn basic strokes. 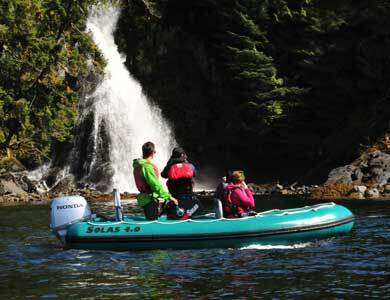 Gain confidence to safely paddle and begin to explore the waters of Southeast Alaska. Instruction is given in both single and double kayaks. Instruction is given in safety techniques such as deep water rescue and self rescue skills. $50/ person, minimum of two people. 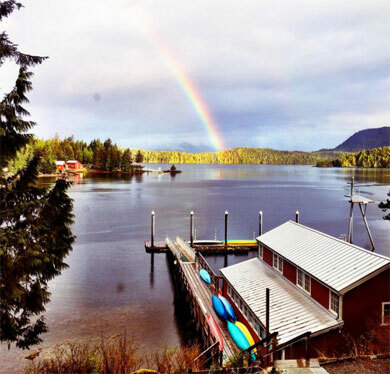 Dedicated to learning and sharing the natural beauty of the areas we paddle, our professional guides have advanced paddling and first aid skills. Many are local and return to SE Exposure every year.